In Vaprio d’Adda, in the hearth of Lombardy, province of Milan, Villa Castelbarco rises on the bank of Adda river and Naviglio canal. It is dipped into an amazing natural frame made of eighty thousand square meters of park where it is still possible to catch sight of free deer. Villa Castelbarco is a private House able to combine the requirements of functionality of the present and an elegant architectural frame of the past. It is possible to date the beginning of the settlement around the 1100 AD. In the same period, according to some scholars, a monastery was built by the Cistercians friars in that area, following the wrecking of what was considered the “centre” of the Cistercians, which dates back to the VII century AD and maybe stood where today the church of “San Colombano”, in Vaprio d’Adda lies. The original structure seems to be very simple, therefore attributable to monks, maybe to the austere tradition of the order of San Colombano (540-615), who followed the message of the Irish Saint. In the architecture of the Villa it is still possible to indentify the different parts built around the court near the church, typical of a monastery. This court is characterized by a double portico that could be the double cloister of the monastery. Up to now it is still possible to feel the sense of unity around the place of worship: the chapter house, the dorms, the refectory are all constructed around the church. The function of the House as a monastery continued perhaps also after the creation of the noble residency, as witnesses a pastoral visitation of Padre Leonetto Clavonio in 1570 and a historic map of XVIIth century AD that illustrated the presence of a Monastery in Concesa. In the XVIIth century AD the House that “sorge aull’aprica altura di Monastirolo donde l’occhio s’allegra d’un ampio e magnifico prospetto” (Cesare Cantù) became a modest countryside house called “The Countess”. It was with the Count Simonetta, who took possession of the House in the XVIIIth century, that the ancient monastery became “Villa of Delights” (Madame de Bocage described the garden of the Villa as an “admirable tableau”. The construction of the little church with the bell tower and the exedra date back to this period. The scholar Tencajoli, who visited the Villa in 1908 and published an article on “Ars et Labor”, described the church as “clear, fresh, artistic, a real manor chapel of other times. The style is mostly baroque, with good frescos and stuccos on the walls and the ceiling. The colorful marbles put a note of happiness in contrast with the primitive paintings. In the middle of the church lies the ashes of Count Simonetta, the founder of the Villa, with the ones of his great grandchild Giuseppe Castelbarco…”. A reliable scientific reference of the existence of the estate in the first half of XVIIIth century AD is the map of Vaprio territory made by the building surveyor Gio Batta Molfi in 1721. In that period the estate was in Count Giuseppe Simonetta possession. The little church was separated by the central body of the house that was divided into two courtyards: the one at east has a square plan, the second one, opened on the west side, has a rectangular plan. Important considerations can be made examining the territory as it appears in the land map: the “via per Concesa” approaches the House and the church; the French gardens are bordered by the Naviglio Martesana; on the canal bank stays a building that probably is the place of Count Giuseppe Simonetta’s furnace. The Villa reached its splendor with the Castelbarcos. Count Cesare, lover of arts and human letters, widened the Villa with wonderful boardrooms, doubled the South Wing (Limonaia Room) and built two structures near this room: a Museum and a small Theatre. He also realized the underground galleries. The Castelbarcos rendered Villa Castelbarco “magnificent and worthy of any comfort and sumptuousness”. Also the huge park was embellished with little lakes, large alleys lined with statues and small temples. The two Empire style buildings were used as Theatre and Museum. In the first one the Count organized entertainments and shows for his guests. The second one initially hosted a picture gallery later transformed in spa, in the first half of ‘900. 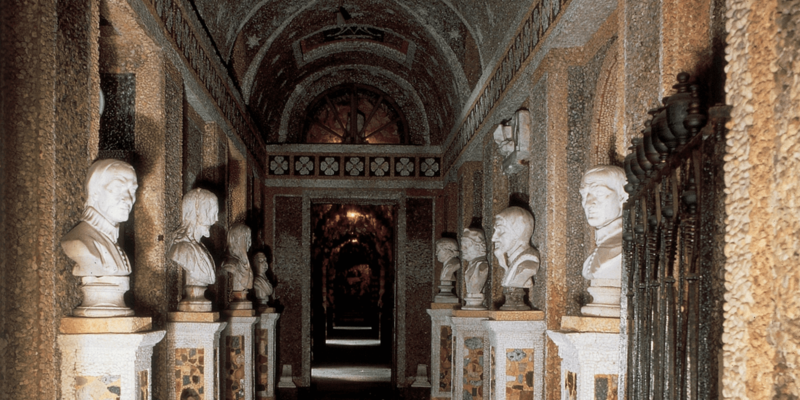 However one of the most important attraction of the Villa were the underground galleries, constructed from 1835 to 1838 by Count Carlo Castelbarco. They are composed of several rooms overlooking the big Naviglio Terrace. 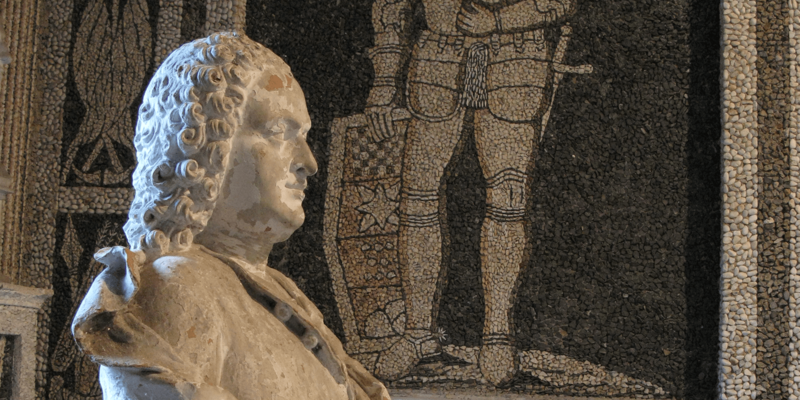 At the beginning of the century the scholar Tencajoli wrote: “the underground galleries are amazing, all mosaic and arranged with variety and delicacy. One of the room is decorated with equatorial seashells. There is also an altar, made as well of mosaic and elegant marbles and embellished with precious objects. Walking in these galleries you can see gush of water pouring out from the floor…”. “…in the Roman Room you can find several antiques from the excavations in Rome and Lazio, but also the bust of Elena Albani and her husband Duke Litta. In a corner is also the bust of Clemente XI (Francesco Albani) and the ones of the Roman emperors Commodo, Teodosio, Lucio, Elio, Aurelio, in addition to some funeral tablets. 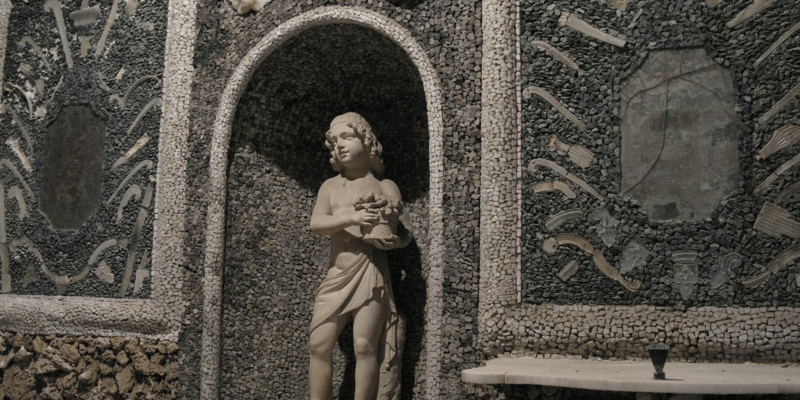 In the Sea Room the walls are topped with rare seashells and the statues of Neptune, of a Lombard King and maybe of a kid of the Castelbarcos are to be seen. Here a Roman trophy is used as chandelier. In the Raphael Room excels a wonderful statue of Hercules with the Abundance Horn placed on a precious Roman altar. This Room contains also the busts of Raffaello Sanzio, Giulio Cesare, Cicerone, Livia, Messalina… In the Egyptian Room you can admire a God of the Pharaoh Period with lion head and human body, a tomb, some Sphinxes and storied columns. In the Etrurian Room the bust of Cleopatra stands out, even if it should be put in the previous room; here are also several earthenware jars, bags, crockery and other objects found in the Tuscan excavations. After these five rooms you enter an Oratorio where the altar is adorned with four marble chandeliers, a lapis lazuli cross and a fine marble head of Baby Jesus with a dagger in his throat. Under the table there is another marble Baby Jesus that dates back to the XVIth century. A second cartographic reference is provided by the 1866 Map of Vaprio d’Adda (Italy Land Registry). The central body is almost the same as today: three courtyards, the doubled Limonaia Room and the Italian Gardens near it.. The North Wing of the Villa, the greenhouse and the Fasanera date back to the first half of ‘800. “Via per Concesa” still follows the ‘700 road layout, while the “viale dei Tigli” came out in the XIXth century. 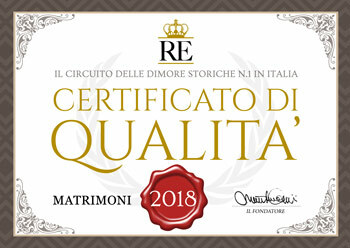 The rectification of the Via per Concesa dates back to 1950 and was made by the Counts Quintavalle, landlords after the Massiminis (who took over from Castelbarcos) until 1975.